Piers Morgan says Howie Mandel is "annoying." Piers Morgan is gearing up for the exciting Tuesday night return of his hit NBC show, "America's Got Talent" (alongside judge Sharon Osbourne and co-host/new dad Nick Cannon), but the veteran host says there's one person he's not looking to sharing the screen with – fellow judge Howie Mandel. "I actually want to torture and dismember [Howie]. He is, without a doubt, the most annoying man in the history of planet earth," Piers told Billy Bush and Kit Hoover on Thursday's Access Hollywood Live of the former "Deal Or No Deal" host. "He does things like, we had these six giant human dancing gnomes on the show — which I hated --most annoying act I've ever seen. And of course, I go and try to grab an hour's sleep in between the two shows, and next thing I know, there's a bang at the door and there's Mandel with the six giant gnomes. "[They] run into my dressing room, flatten me on the floor, and begin dancing on my head," he added. And the tricks didn't stop there! "The next day we went to Atlanta," Piers continued. "I try to come out of my dressing room… I can't. There's a soda can dispensing machine rammed against my door. Next thing I know, a large pipe is inserted under the door and a foul smelling yellow pungent gas is emitted. This is what this man is like!" "I like this! I like this friendly banter – it's good," Kit laughed about Piers' continued his rant over Howie. 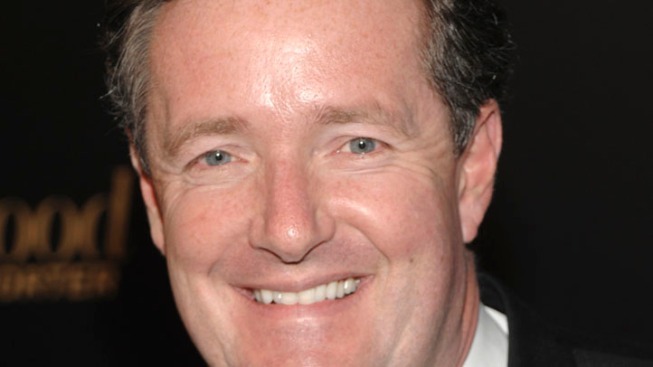 "I want to kill him," Piers retorted. "It's not friendly." Howie isn't the only celeb on Piers' naughty list – the CNN host recently banned Hugh Grant from his talk show after the former "Notting Hill" actor criticized British tabloid newspapers. "[Hugh] announced last week that he wanted all British popular newspapers to be banned. I used to edit two of these newspapers, so I decided to retaliate," Piers explained referring to his time at The News of The World and The Mirror, British tabloids. "So Hugh Grant is now banned worldwide from my CNN show in perpetuity for life. That's it. Gone." While Hugh may not be welcome, Piers said he would gladly accept Arnold Schwarzenegger as a guest on "Piers Morgan Tonight" if the embattled former California Governor wished to publicly apologize for his recently revealed infidelity and siring of a love child. "I have interviewed him before for GQ magazine a couple of years ago, and he was a fantastic interview — this was before recent events," Piers revealed. "It's like Tiger Woods — death by a thousand cuts. You leave these things, and more and more stuff comes out… He's made a catastrophic error here and it's had big repercussions. I happen to still like the guy, and he's been very good to me and if he wanted to do a mea culpa on my show, I would recommend him to do that. "There's a power of being honest and open about these things," he added." Catch "America's Got Talent" Season 6 premiere on Tuesday at 8 PM on NBC. PLAY IT NOW: Who Is Driving Piers Morgan Crazy On 'America's Got Talent'?